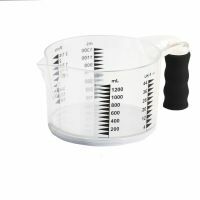 These cups, jugs and spoons measure wet and dry ingredients in a range of measurement units. 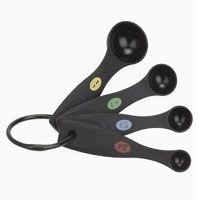 They have been mainly designed for blind and partially sighted people or a person with the use of only one hand. When choosing a measuring utensil ensure it uses the measurement units you prefer. For example, metric grammes or imperial ounces. 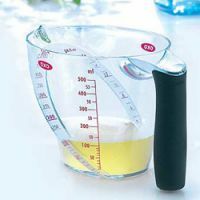 Using colour coded or large print measuring spoons or cups negates the need to visually align liquid to a mark on a jug. 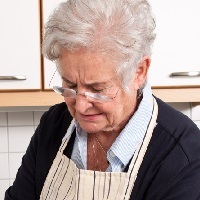 Dry ingredients are levelled off at the top of the cup or spoon usually using a knife. You can fill them over a container to catch any spills. 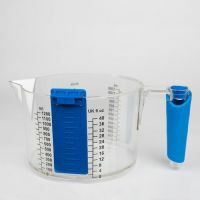 The 'talking' measuring jug has a large volume capacity (with a range of measurement units) and can be reset to zero to allow you to add and measure further wet or dry ingredients. As an alternative you could use a talking weighing scale if you want to use the 'add and weigh' feature for a wider range of dry ingredients. 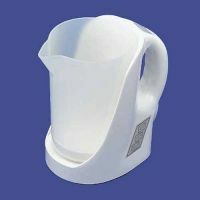 Liquid level indicators give either an audible sound or vibration indication when sufficient liquid has been poured into a cup, glass or mug (RNIB, 2008), Scheiman, Scheiman and Whitaker, 2007).